In June, staff held a Charity Day. Fundraising activities ranged from teams wearing mis-matched shoes through to various cake and food sales. Thirty-five employees also signed up to become ‘JT Daredevils’. At random, ten were selected. Then, in September, the intrepid Skydive volunteers plunged at 130 mph for 30 seconds from 10,000 feet above St Aubin’s Bay. They then parachuted down to land close to the Gunsite slipway. 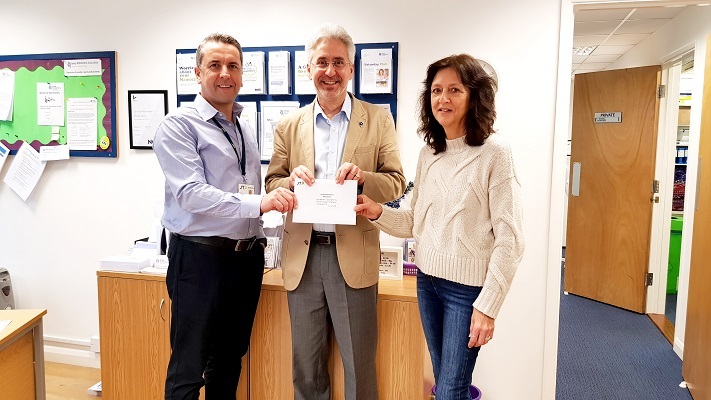 Mark Blamey, Manager of Jersey Alzheimer’s Association, said: “Jersey Alzheimer’s Association is extremely grateful for the wonderful staff at JT. Additionally, they have kindly chosen to support our charity throughout 2017. The £10,000 will cover the cost of running our Drop-in Centre at de Carteret House in Hillgrove Street for six months.